Small beginnings and big dreams: that’s the story of this Congregation of priests, brothers and lay associates. The Missionaries of the Precious Blood were founded in Italy in 1815 by St. Gaspar del Bufalo. St. Gaspar was a Roman-born priest who was small in stature but blessed with boundless energy to carry out God’s work. A visionary and preacher who had a gift of persuading people to follow his seemingly outlandish dreams, Gaspar secured an abandoned tenth century abbey near Giano, Italy. On August 15, 1815, this became the birthplace of the Congregation of the Most Precious Blood (C.PP.S. ), a new society of preachers and missionaries dedicated to the Precious Blood of Jesus. Gaspar’s small band of Missionaries worked among the country people of Italy. They staged parish missions where they preached day and night, in churches, on street corners and anywhere else that people congregated. They dedicated their lives to renewing a Church that had been battered and rejected during Napoleon’s invasion of Italy. From town to town, St. Gaspar and his Missionaries traveled, spreading the Good News that Jesus gave his Precious Blood to save the world. They reached out to those who felt lost or abandoned, to the sick and suffering, to those in hospitals and prisons. St. Gaspar established mission houses throughout the Italian countryside where his Missionaries lived together. They drew strength from the Precious Blood of Jesus and from each other, then went forth to their Missionary work. Led by Fr. Francis de Sales Brunner, C.PP.S., (pictured at right) the Missionaries came to America in 1844. They had been invited to serve here by Archbishop John Baptist Purcell of the Archdiocese of Cincinnati, who needed priests and brothers to minister to the German-speaking Catholic settlers in central and western Ohio. Fr. 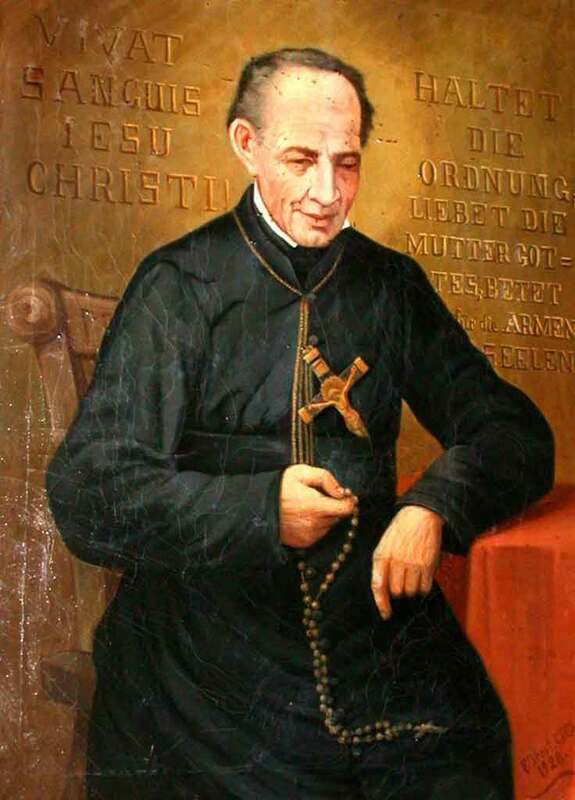 Brunner was a Swiss-born priest of such zeal that he used the long Atlantic crossing as an opportunity to lead a nine-day retreat to the priests, brothers and candidates who accompanied him to the United States. He led his small group of Missionaries to found parishes and mission houses throughout western Ohio and Indiana. While the priests served in parishes, the brothers performed the back-breaking labor of clearing the land and building religious houses at 10 different locations. Fr. Brunner never had a spare nickel and his priests were criticized because some thought them rough around the edges and under-educated. Yet Fr. Brunner and the Missionaries who followed him founded dozens of Precious Blood parishes, as well as the Sorrowful Mother Shrine in Bellevue, Ohio. From those parishes came the next generation of Missionaries to serve in the United States, and then the next and the next. Missionaries established two colleges, Saint Joseph’s College in Rensselaer, Ind., and Calumet College of St. Joseph in Whiting, Ind. From the United States, the Missionaries went on to serve in Chile in 1947, then Peru and Central America. God alone keeps an inventory of the Missionaries’ accomplishments, but people in Precious Blood parishes, those who were educated by them, or who met them in other ways have their own favorite stories of the times when a Precious Blood priest or brother stepped into their lives when he was most needed.